Gerard Auneau, “L’ Application de la Legislation Sociale au secteur sportif et du loisir sportif dans l’ Europe Communautaire de 1993”. T. A. Bhuvanendra, “Games Sociology - An Academic Discipline”. E. Venizelos, “Constitution and Sports”. M. GreenbergHossein Aghaie Nia, “Abuse of Rights at Sports”. W. Decker, “The Gymnasiarch’s Law in Ancient Greece”. 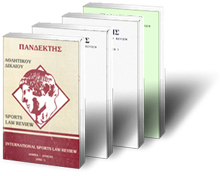 G. Dionyssatos, “Sports Disputes and the Right to Legal protection”. P. Jacq, “International Sports Structures”. J. Nafziger, “Interplocking rings of international Sports Law”. 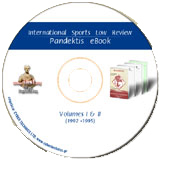 D. Panagiotopoulos, "Sports Law: A scientific approach". D. Panagiotopoulos, "The meaning of the participation in the Olympic Games and the case of ''New'' Yugoslavia". D. Panagiotopoulos, "The problem of resignation of members of the Sport Federation Board of Directors, its restructure and the decision of the General Assemply to appoint a new". + L. Pettiti, "Droit et Sport en Europe". K. Remelis, "Restrictions to the conventional freedom of professional athletes". E. Reschke, “Sprotrechtliche aspekte zum doping unter besonderer beruecksichtigung des rechts inder bundesrepublik Deutschland”. E. Reschke, "Sport - Recht - Umwelt zur rechtlichen erfassung des konfliktes zwischen sport und unwelt". L. Silance, "Juridical aspects of transfer". Leo Vandeveld, "Right to Physical Integrity of the professional sportsman". G. Farantos, "The Philosophy of Sports Law". G. Farantos, "The harmonious movement of the body and the spirit means of Gymnastics and Music Education according to Plato, as a proceeding of Justice, Beauty and Goodness". Klaus Vieweg, "Sport and Law of Sport in a federal system - The situation in the Federal Republic of Germany". This books are supplied by IASL in a eBook CD-ROM version. 1. Convention Europeenne sur la violence. 2. European Sports Charter (by D. Gargalianos). 3. Code of Sports Ethics. Les mesures a prendre par les organisateurs de matches de football et les pruvois publics, Jun 4, Strasbourg 1993.
International Committee for Fair Play Statutes. International convention on violence, L. 1887/1988. Professional Athletes - Sporting Societes Anonymes, L. 1958/1991. Regulation of Debts of Football Societes Anonymes (PAE), L. 2021/1992. Organization and Function of Union of Football Societes Anonymes (EPAE), PD 505/1991. Organization and Function of Union of Clubs of Professional Basketball Players (ASAK), PD 61/1992. Studies of athletes in OAE - AAE, L. 2009/1992. Relationship of Clubs and Volleyball Players, MD 41117, GG 1035/19-12-1991 iss. A'. Relatioship of Football Players-EPAE (GG 380/9-6-1992, iss. A'). Registration - deregistration of Professional Football Players, MD 41167, GG 989/A/29-11-1991, iss. A'. Registration - deregistration of Amateur Football Players, MD 22557, GG 437/7-7-1992, iss. A'. Registration - deregistration of athletes, team sports besides football, MD 26182 - 21451 GG 475/1-7-1992, iss. A'. Registration - deregistration Professional Basketball Players, MD 30261, GG 489/22-7-1992, iss. A'. Motivation for sporting activities, MD 15225/A3/407, GG 65/12-2-1993, iss. A'. Regulation N. 1, Relationship of Clubs and Professional Basketball Players, MD 37245, GG 965/1991, iss. A'. Relationship of Clubs and Professional Football Players, MD 4953, GG 370/9-6-1992, iss. A'. Conditions Registration - deregistration of professional football players, MD 30403, GG 158/10-8-1992, iss. A'. Amendment of Regulation Ii 1 on professional basketball players, MD 33016, GG 546/1992, iss. A'. Registration - deregistration of amateur football players, MD 21149, GG 475/30-6-1993, iss. A'. Amendments of Article 40 of L. 1958/1991, L. 2168, GG 147 iss. A'. Regulation of subjects concerning guns, ammunition, etc. and other provisions, L. 2168, GG 147 iss. A'. Regulation of subjects concerning the administration of education and other provisions, L. 2188/1994 (Amendments of Law 2009/1992 on the studies of athletes in AAE - OAE). Conditions for Registration of national and foreign athletes or athletes of the same descent with the exception of footballers and professional basketball - volleyball players, MD. 25150, GG 475/30-6-1993, iss. A'. Loi 89 - 432 du 28 Juin 1989 relative a la prevention a la repression de l' usage des produits dopants a l' occasion des competitions et manifestations sportives (1). Fragm. From: journal officiel de la Republique tunisienne, No 47, Mardi 14, Vendredi 17 Aout 1984, p.p. 1753 - 1754. Recommandation No 1/93 aux parties concernant les mesures a prendre par les organisateurs de matches de football et les pouvoirs publics.